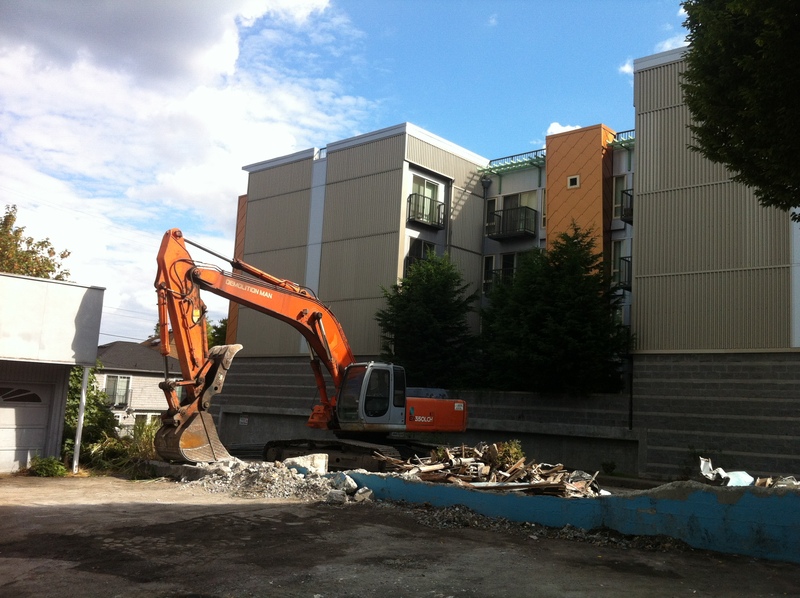 In April 2011, CHS counted eight major development projects across Capitol Hill in various stages of demolition and construction. Some of those are complete — and already fully leased to hundreds of new or newly-addressed Capitol Hill renters. Some are still far from completion. More than a year later, a similar wave of projects continues to ripple across the Hill. Below is an attempt to offer a similar documentation of current apartment and large project construction activity on Capitol Hill. For the most part, the listings are focused on projects that have already knocked down the past or are started on what comes next but we’ve also thrown in a few of the more significant projects still in the paperwork and process phase. We may also include a few microapartments in the roster if digging and construction has begun — but planned projects in this category will need to wait for coverage of the trend we’re also working on. As usual, please lend a hand and let us know about any digging or construction activity we missed. 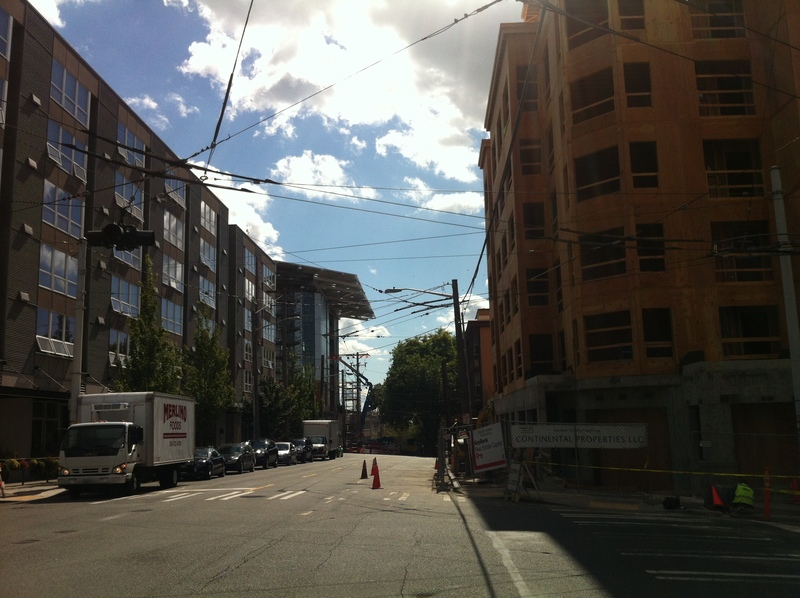 19th Ave E at E Mercer: Let’s just call it Tallulah’s project. 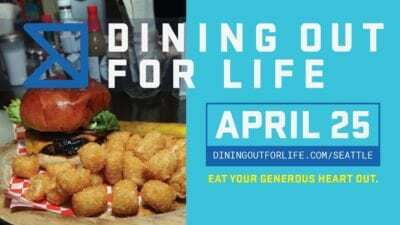 Linda Derschang is already signed up to occupy this four-story apartment building’s premier restaurant space across the street from the venerable Kingfish Cafe. Demolition has already knocked down the old Holiday Craft Store and Greg Nickles fave Capitol Hill Hair. We appreciated seeing the city’s “Protect This Tree” signage on this yarn-bombed trunk. Ruth Court: 125 18th Ave E construction is a long way off but the landmark process is underway. 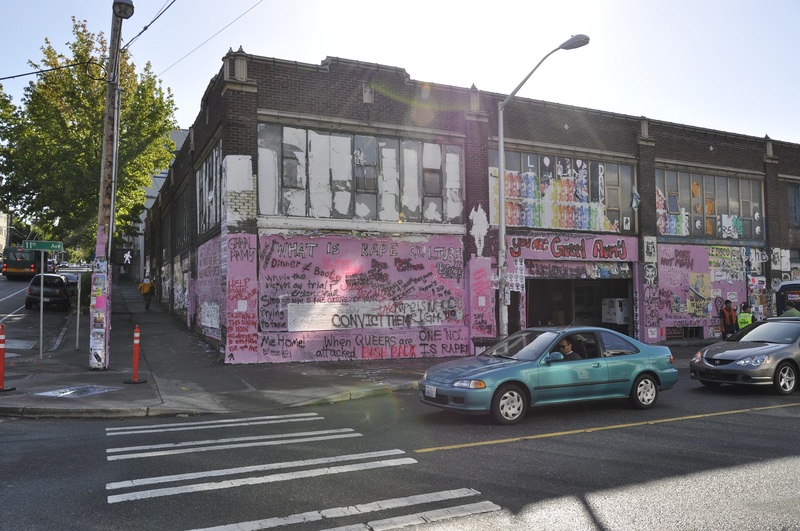 16th Ave Anhalt overhaul: The developer on this project is gearing up with community outreach and a landmark nomination before launching a design review process for the overhaul of the old apartment building. 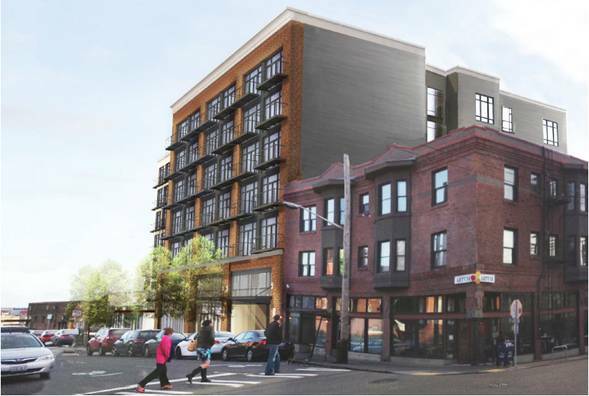 12th Ave Arts: Mixed-use apartments, office and theater project backed by Capitol Hill Housing will break ground later this year. As soon as the East Precinct figures out where to establish a new, temporary parking lot for its officers. The Cameo: Back from the dead or, at least, comatose, this project survived the economic downturn to bring another six stories of mixed-use to the corner of 15th and Pine. The project has moved beyond the foundation phase and is that amazing point in construction where buildings suddenly go from framing to existence. The Bullitt Center: The greenest commercial building on Capitol Hill if not the world, the new headquarters for the Bullitt Foundation will wear a giant solar array as a crown when it is completed later this year. 14th Ave Porchlight project: We’ve heard the six-story mixed-use development planned for 14th called the REO Speedwagon or somesuch. We like it. No word on when, exactly, construction will begin but the business shuffle on the street has already begun. 13th at E Pine: Seattle firefighters stood by idly as the old insurance office and knick-knack antique store at the corner of 13th and E Pine was destroyed. Maybe they’ll want to move into the six-story apartment building slated to be built there. The Undre Arms Project: We don’t think Alliance Realty will go with our name for it but demolition is complete where Union meets Madison and the Undre Arms once stood. 1020 E Union: Alliance still has its hands full across the street as a community group pushes back on their plans to demolish the Davis & Hoffman building. Sunset Electric: The construction wall has gone up. This six-story, mixed-use development will follow. BMW project: 714 E Pike is still a paper project with the seven-story plan set to be finalized in coming months. Mercedes project: The developer doesn’t even officially own the property yet. But it’s coming. Bellevue at Pine: The Marion Apartments are gone and this six-story, 118-unit mixed-use building with about 13,000 square feet of ground floor retail project is reaching its midway point. Terravita: The project was supposed to be completed this spring but work appears to still be underway on E Pine at the former location of the People’s Parking Lot. Stanley Automotive overhaul: Hunters Capital’s restoration of the 1910 auto row-era building is nearing completion at Pine and Bellevue. Melrose & Pine: Following the Bauhaus freakout, things are looking better for the Melrose & Pine project that will bring seven stories of mixed-use development — and preservation — to this stretch of E Pine. No schedule for construction yet — the project is still in the paperwork and process phase. 1519 Minor: Construction of a new 115-unit, mixed-use apartment building above the Pillars Park off-leash area is underway. Ada’s: The smallest project on our list? Central 15th Ave E is mostly isolated from the current wave of active development but we thought we’d include this planned overhaul of the old house that used to be home to Horizon Books and will soon be home to Ada’s Technical Books. 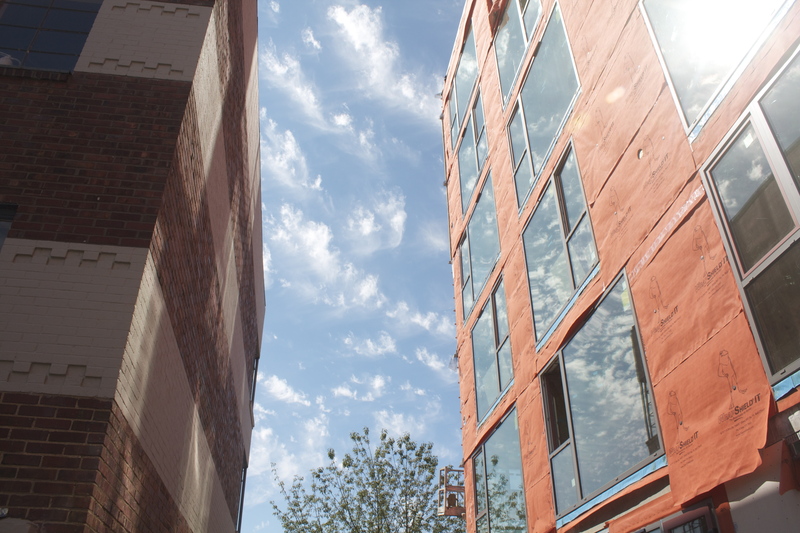 The Bel Roy: CHS visited last week — “The restored BelRoy Apartments are joined by the addition of two new buildings that replaced five single family homes to the north and east. The change has doubled the capacity of the BelRoy to more than 100 units in the project. A snug 1,000 square feet of commercial space at the far north end faces Bellevue Ave in the shadow of a tall cedar tree that the project was able to work around and preserve. A “network of gardens” will wind its way around the new campus.” Leasing begins this fall with a planned early 2013 move-in. 1145 10th Ave E:We surrender. No word on the status of this Continental Properties project (they’re behind the Cameo, too). Any details on what’s up over St. Mark’s way? UPDATE: Comments say groundbreaking ceremony was Wednesday morning. CHS apparently not invited! 500 Harvard Ave E: CHS received about a million tips when the previously wildflower and weed-covered lot behind The Joule suddenly snapped into action in recent weeks. “Construction of a six or seven story, 82 unit building with below grade parking,” the early land use permit paperwork for the project reads. We’ll keep you posted. The Lyric: After its 21-month construction schedule, leasing is underway and commercial tenants will likely begin to emerge in this giant new addition to Broadway. You’ll soon find Bank of America returned — as well as the bagels. First Hill streetcar: Service begins in 2014. Broadway will probably look like this until then. Capitol Hill Station: The bidding process for developing the area around the Broadway light rail station is about to begin. Construction of the station site and the new subway connecting downtown to UW continues. See? Microapartments: 1728 Summit, 227 Belmont Ave E demolition done (we’re told), 422 11 Ave. E under construction, 100 13th Ave lot cleared… more? 22nd at Madison assisted living project: Welcome to our soon-to-be new readers at this new six-story Aegis Living project. Still in early construction. Melrose Square: This fall, the green overhaul of this former auto row building will be home to new Lebanese restaurant project Mamnoon. Northwest School gym: Capitol Hill’s Northwest School will expand onto E Pike with a new gymnasium and offices. Reports of early signs of construction in the comments below. 418 Bellevue Ave E: Construction on seven stories of “workforce” housing is underway, we’re told. Stream Belmont: The construction is beginning at 500 Belmont Ave E — former home of the Belmont Biohazard house. Former Auto Pro building – permit app includes residence & parking & restaurant along with substantial alteration to the building. also, the restaurant coming in across the street from Terra Plata – that’s a substantial alteration to that building with a unique triangular roof that was framed into place. this article makes me tired. C’est suffi already. The Northwest school parking lot project has started to move forward. No longer allowed to park there and they are tearing up the pavement. Looked like they were having a little ground-breaking ceremony this morning. 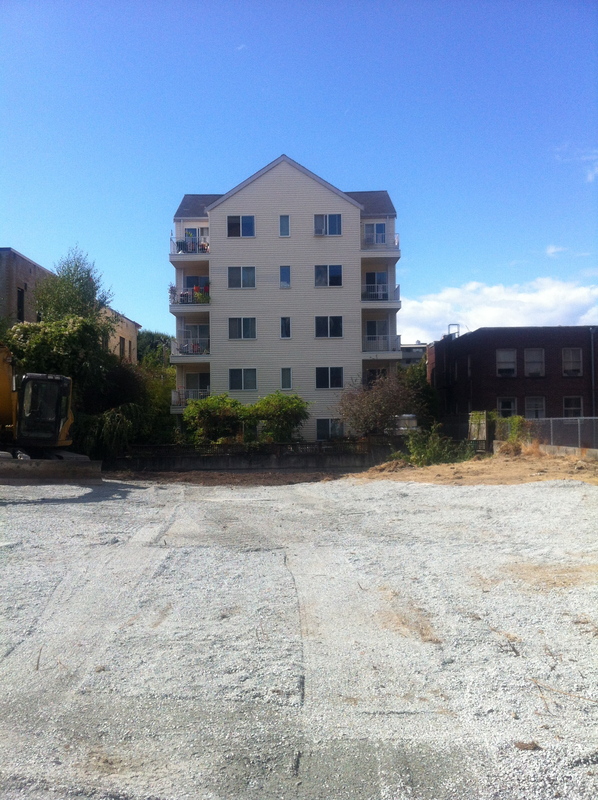 An aPodment project at 306 Summit Ave E is still under construction. According to my neighbor here in 308 Summit Ave E, the aPodments will be open in late October or early November. Thanks for Auto Pro tip. Finally some paperwork to look at. Will follow up! Mamnoon qualifies. I’ll add it! Clearly, my invitation was lost in the mail! Is also under construction. Is that a microapartment? I’m a little disappointed. I was hoping for something to bring more life to this area so that it’s not so deserted at night. Otherwise, I’m happy about new development (especially by Linda Derschang). I called the developer after Twilight Zone was tagged and he kindly sent someone and painted it out immediately (with the original colors, class act!) at that date, I asked what was up with the development as I was looking forward to the design elements in the rendering of the Deano’s space, he said he was waiting for financing, this was a couple months ago. I hope that project goes ahead. I live on the block and have no idea what you are talking about. According to sign on the property: “Coming soon. Six luxury townhomes; 4 at 3,000 square feet and 2 at 2,000 square feet.” Project is almost complete. A friend of mine who is the manager of an adjacent apartment building told me that this lot will be used for the construction office and staging area for the new building going up on the NE corner of Republican and Belmont (500 Belmont). There were three houses located there. The construction trailer is already in place. construction is well underway, supposedly there will be 2 tower like structures, with about 24 ‘rooms’ in each tower…damn, it’s impossible to find many details about thee things- part of the stealth M.O. -ugh! Isn’t the Auto Pro building on Pine & Summit? Or is the building by Six Arms? Any word on the one at Pine & Summit? Last we heard was it is in permit limbo. #14 Former Marion Apts – it looks like work has stopped for a week or so. They have the foundation ready to pour, but it hasn’t happened yet. Too hot to pour concrete? #15 I would say Terravita is done. A steady stream of moving trucks have been passing through there for about a month. Work on the athletic club has started. #16 All the equipment has been removed from the alley behind the Stanley Auto/Area 51 building so I’d say the work is done. Beautiful job too. I just wish they’d put the Raff’s sign back on the roof. I miss seeing it from my window. #26 microapts: the land use sign is up announcing the 49 microapts in the 1700 block of Summit. Wonderful compilation. It excludes First Hill, of course, where there are more. 1200 Madison/1000 Minor is up (all 17 stories) and running. Thanks for this! I thought this blog, or its writers, knew about this development yet I haven’t heard a peep.